Tech in Motion announces top 10 local companies for tech and opens public voting to determine winners. 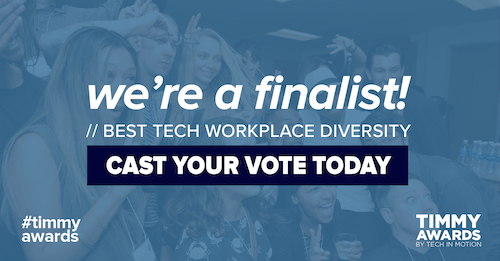 CHICAGO, IL – Tech in Motion Chicago has chosen SpotMe as a finalist for this year’s Best Tech Workplace for Diversity category in the fourth Annual Timmy Awards, which recognizes the top workplaces for tech professionals in the Chicago area. SpotMe joins an elite list of this year’s finalists, including: RhinoDox, Infutor Data Solutions, NowPow and many more, which the public can vote for here. SpotMe is the leading technology and service provider of enterprise engagement platforms with a focus on live events, virtual meetings, and long-term engagement. SpotMe has served more than 5 million users worldwide, and over 200 organizations and 75 Fortune 500 companies rely on SpotMe to create change with transformative events and drive perpetual engagement with employees, customers, and partners. Navigating differences can be challenging at first. When you have a group of people who all think alike, it is easy to reach a comfortable consensus. We would not be where we are today without our incredibly diverse, 140 people team driving our growth across our US, Europe and Asia-Pacific offices. “As the event series grows each year, we are excited to celebrate the diversity, innovation and growth in the community – which we recognize is represented by these finalists whether or not they walk home with an award,” says Mandy Walker, Director of Marketing at Motion Recruitment, creator of Tech in Motion. “Having such inspirational finalists in the running makes the Timmy Awards exciting every year. Chicago’s 2018 Timmy Awards will be held on October 24th, 2018 at 1871, 222 W. Merchandise Mart Plaza Suite 1212 from 6 to 8 pm. This free event is open to the public and will consist of tech demos, entertainment and networking. The ceremony will also feature presentations from Chicago top tech leaders. If you are interested in learning more or attending Tech in Motion’s biggest event of the year, visit the Timmy Awards or RSVP here.